I’ve said on here often enough that I’m not buying the idea that National are good managers of the country’s finances. IMHO they’re just another bunch of smoke and mirrors socialist charlatans, and I have the feeling we’re very soon about to learn this harsh truth in a most unpleasant way. Let’s look at the economic growth achieved in 2014. Headline real GDP growth was a very impressive 3.5 per cent. However, population growth was 1.6 per cent so per capita GDP growth was only about 1.8 per cent. Commodity prices – in particular dairy – had a big run up in 2014 resulting in a positive impact of around $5 billion to nominal GDP. Working out the contribution to real GDP growth is difficult, but if we assume about half of this fed through directly into GDP, then that accounts for about 0.9 per cent of growth. Likewise the Christchurch rebuild got into full swing and probably added a further 0.6 per cent. So real GDP growth per capita, excluding the one-off effects of surging commodity prices and the Christchurch rebuild, was about 0.3 per cent. Not quite so flash. Of course he’s spot on. Its what I have been saying on here for months. I’m no economic expert, but unlike recent graduates from our dysfunctional socialist education system, I can do maths. There’s also the quality of the expenditure. If the rebuild of Christchurch is doing great things for this country’s economy, well hells bloody bells why don’t we just knock the whole damn country down, starting with Wellington and then Auckland?? And then wherever the hell else you choose, because it doesn’t matter, as we’ll spend trillions to rebuild them and it will add to GDP and National won’t just look like economic masters they’ll be economic genii. Auckland real estate agents will tell you National are genii already, because they have been selling record numbers of houses, and some are now making millions. They sold more than 8,800 homes in March, the largest number of monthly sales since 2007. But wait- the number of new listings was the lowest recorded for April by realestate.co.nz, with only 9,673 coming on to the market, a fall of 5.6% on the same time last year, and a decrease of 18% from March. So how do we fix this calamity? We bring in another 100,000 people from different cultures and we tell NZers who complain about feeling like foreigners in their own damn country to shut the hell up and enjoy the vibrancy and diversity. Once again, it won’t fix any damn thing in the least but Gee Whiz what a damn GDP we will have then and it will make our $100 billion dollar debt look like nothing. 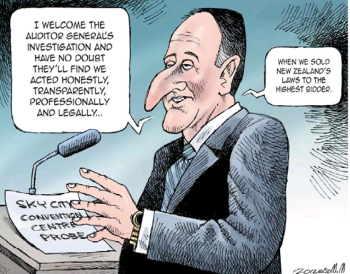 In other circles, outside govt, this crass sell out of traditions and cultures done just to consolidate John Key’s hold on power, would be seen for nothing but a Ponzi scheme, and its perpetrators would be investigated and charged and found guilty of false pretences and fraud. But propped up by donations from real estate companies and other’s profiting from this farcical excuse for an economy, the National Party rolls merrily on. Just don’t whine when the Ponzi scheme reaches the end of the road voters, and every one scrambles to try and avoid being the one left holding the basket. You brought it all upon yourself. Look at Greece. You forgot to mention how they cooked the books. What Government entities did not report on time for the budget. Last year it was the EQC and then Billions of shortfall, in their funding. The razor thin surplus was all smoke and mirrors, and well within the margin for error. And yes I am also at a loss as to how an earthquake can be construed as positive for the economy long term. Maybe we should have a capital gains TAX, new Taxes are always popular, right. We could then tack advantage of the capital losses when the Ponzie scheme falls over. Surplus? There was no surplus. Just more borrowing, or selling off stuff to fudge the numbers. Of course selling everything is basically the right thing to do – but the money should be returned directly to the corporates and top-rate taxpayers who paid for it, not used to pad out the budget e.g. to pay for yet more bludging. The EQ in Chch was good because a fair wack of the money now being spent has flowed in from offshore via insurers. We sent it away first of course but the return will be a temporary blip that looks good. It won’t last. Without inflation the govt debt just looms large – inflation of 3% would see the $ value of debt halve in 20 years but when inflation is static or going backward we are in the crap. Central banks are not buying gold because they like jewellery. When English was questioned on The Nation about the effect of immigration on the economy and that he could do something in this area ,he said ‘immigration was a problem of success’ . Good post, one of your best yet. I used to believe in all the stuff I read in the media and it was only reading below the line comments in The Telegraph did I begin to make sense of the b/s we are fed on a daily basis from the MSM. Thanks for the link Caleb. Another fine article by James Delingpole. Him along with Mark Steyn, Andrew Bolt & Gerald Warner are the best right wing journalists in the English speaking world. Indeed, you could replace “Conservative/Tories” with National in that entire article and it would ring exactly true to what is going on over here. You’re right Caleb,you could replace the word Conservative with National and that article would be amazingly accurate still.